Paul Torfs, Robert Smets, Simon Joukes, Danny De Raeve across from Michael Moorcock at SFANCON 3 in 1972. 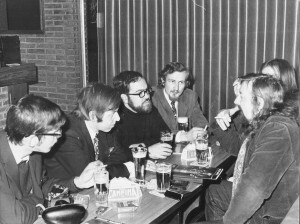 Antwerp fan Herman Ceulemans says that SF fandom in Belgium now is “nearly extinct.” In the glory days of the Seventies, SFAN, a club based in the country’s Flemish region, hosted popular Fancons and BENELUXcons that attracted fans from all over. The group also produced a monthly magazine, known in its last incarnation (the only copies I saw) as Rigel. Ceulemans has established a website to capture as much of this history as possible before everyone who remembers it fades away. Until the beginning of the eighties SFAN remained active and in addition to the magazine also organized annual “conventions” organized with well-known authors as guests of honor. Eventually the union, mainly by personal disagreements, quietly disappeared and was replaced by individual initiatives. He’s looking for photos from or articles about the SFANCONS to add to his site — hopefully some from English-language zines. Contact him at ceulemans (dot) herman (at) telenet (dot) be. This entry was posted in Clubs and tagged BENELUXcon, SFAN by Mike Glyer. Bookmark the permalink.